Rudraksha is the seed of the Rudraksha tree. Rudraksha beads are worn for good health and are used in a rosary for religious attainment through Japa ( Prayers). They are used for physical and mental health, to reduce stress and also for meditation. Rudraksha always gives positive effects to the wearer and has no malefic effects as compared to Ratnas / stones. According to the Shiva Purana, the berries of the rudraksha represent the tears of Rudra which he shed in a sad and disheartened state, soon after he came out of his meditative state. He crystallized them into the shape of seeds and distributed them among the four castes viz. – the white berries for Brahmins, the yellow for Vaishyas, the red for Kshatriyas and the black for Shudras. The importance of Rudraksha is judged by the number of faces or sides it has. As many as 38 varieties of Rudraksha are mentioned in the Hindu scriptures, but of them, 21 are most conspicuous. 1 Mukhi Rudraksha (One faced Rudraksha) has the highest value and is rarest in availability. Each particular Rudraksha bead has its own special properties, which have been well described in the ancient literature. Below is given the detail of 1 to 10 Mukhi Rudraksha. A one-faced rudraksha is considered to be the incarnation of Lord Shiva. It is rarely found and only ‘Chakravarti’ kings or Siddha Purushas (realized souls) are said to possess it. According to Hindi scriptures, every year Lord Shiva endows three such seeds to the world. He bestows one to his most celebrated devotee, the second to some political ruler and the third is kept by the Lord himself. Lakshmi, the goddess of good fortune and prosperity confers her choicest blessings on the person who possesses it. The two-faced rudraksha stands for Ardhanarishwara, a combined image of Lord Shiva and Goddess Parvati. Therefore, it is also known as the UNITY Rudraksha as it brings about unity for its wearer. It reflects the tantric view that the Almighty has the elements of both sexes in him. According to the Shiva Purana, the beads symbolize Isa – the lord of devas. Their possession ensures the fulfillment of all desires, confers tantric powers and frees a man from the sin of cow slaughter. The three-faced rudraksha represents the Triloka or the three worlds, consisting of paradise, hell, and tala. The three Mukhi Rudraksha has three natural lines or Mukhas on its surface.Three Mukhi Rudraksha also represents Agni, i.e. fire that burns and consumes everything. This Rudraksha helps the wearer to fight with all kinds of situation and win over them. Such beads are particularly useful for the unlucky and lugubrious. The four-faced rudraksha is said to embody the spirit of Brahma and represents the four Vedas. Four faced Rudraksha has four natural lines from head to bottom at equal distance. This Rudraksha is blessed by Lord Brahma who is said to be responsible for the creation of the whole Universe. As it bears the influence of creative wisdom of the four-headed Lord Brahma, the four-faced Rudraksha gives the wearer a creative power and knowledge and all the four results Dharma, Arth, Kam, Moksha. The most common Rudraksha is five Mukhi Rudraksha. A 5 Mukhi Rudraksha have five natural lines from head to bottom. It stands for the five faces of Shiva- Sadhyojat, Vamdev, Aghor, Tatpurush, and Ishan. Such beads are sacred to Anjaneya (Hanuman) of the epical work, Ramayana, and make powerful amulets for humbling the enemy. They are also used as a charm against scorpion bites. It gives protection from all kind of diseases and provides mental peace and happiness. As per scriptures and Puranas, its ruling planet is Jupiter. The wearer of 5 Mukhi mala gains health and peace. 5 Mukhi Rudraksha monitors blood pressure and cardiac ailments. Rosary (or mala) of 5 Mukhi Rudraksha is also used for Japa. It is said that the wearer of Five Faced Rudraksha mala never gets untimely death. The six faces represent Kartikeya, who, according to Hindu mythology, is the god of war and the ruler of the planet Mars. 6 Mukhi Rudraksha is a low priced Rudraksha and it can easily be found. A 6 Mukhi Rudraksha has six lines originating from top to bottom. As per Jablopnishad 6 Mukhi is blessed jointly by Kartikeya and Ganesha both sons of Lord Shiva. This Rudraksha improves artistic qualities, expression power and makes the wearer good orator. As per scriptures and Puranas, the ruling planet of 6 Mukhi Rudraksha is Venus and its use can ensure amazing success in business. The seven-faced bead is known as ‘Anang’ or ‘Anang Swaroop’ or ‘Ananta’ meaning the Lord Brahma who is dimensionless. 7 Mukhi Rudraksha is found nearly round in shape. This Rudraksha represents Mahalaxmi the goddess of wealth and wearer of this Rudraksha is blessed with good health and wealth. The seven faces of Rudraksha also assigns to seven mothers and they are – Brahmi, Maheshwari, Kaumaari, Vaishnavee, Vaaraahee, Indraanee, and Chamunda. 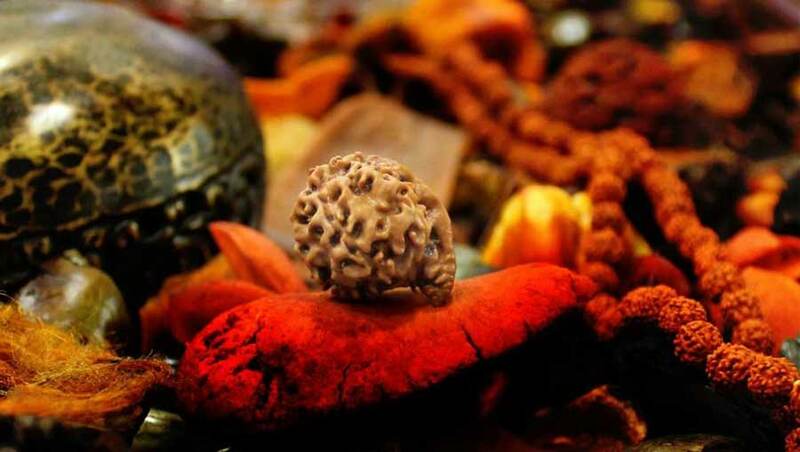 This Rudraksha brings fame, wealth, progress in life, and also removes bad luck. As per scriptures and Puranas, seven Mukhi Rudraksha governs Saturn and sublimates the malefic effects of Shani such as Diseases & Death occurring suddenly without any cause, impotency, cold, obstruction, hopelessness, despair, delay in achievements, long time disease, scarcity, worry etc. The eight faces represent Shakti in her Bhairav which is her terror aspect. Its wearer can subject the spirits to himself and goad them to serve him. 8 Mukhi Rudraksha is a rare bead. This Rudraksha is blessed by Lord Ganesha. This Rudraksha also pacifies the planet Rahu. As per Rudrakshajabalopnishad, it is a form of eight mother goddess, eight Vasus, and Ganga. The wearer is blessed by the blessings of these three too. It removes the obstacles and improves intelligence and health. The nine faces refer to the yogic cult of nine Nathas or adepts. They are used for achieving honor in the world and for subduing the enemy. Nine Mukhi Rudraksha too is a rare bead. It is oval in shape. This Rudraksha is blessed by Goddess Durga, the Goddess known as Shakti i.e. Power. In Hindu mythology, it is believed that She had nine incarnations which means that she took birth on earth nine times in different forms to protect and save the lives of Her followers. These all incarnations or goddess are worshiped each day by their followers in Navratri. Its ruling planet is Ketu, which is a shadow planet like Rahu. Nine Mukhi Rudraksha is beneficial to sublimate the ill effects of Ketu. It also helps in removing the Kaal Sarp Yoga effect. The ten faces of Rudraksha represent the ten incarnations of Lord Vishnu on the earth which are Matsya, Kurma, Varaha, Narasimha, Vamana, Parasurama, Rama, Krishna, Buddha, and Kalki. One who holds it remains free from the evil influence of planets and hoofed spirits. The women use it for the security and well-being of their husbands. The auspicious time for wearing the rudraksha rosary is said to be during the lunar and solar eclipses and the full moon or the new moon day. Om Trayambkam Yajamahe Sugandhim Pushtivardhanam Urvarukamiv Bandhana Mrityormukshiya Mamritat; om haum Aghore Ghore hum Ghortare hum om him Sri Sarvatah Sarvadig namaste Rudrarupe hum”. Every Rudraksha has a different number of faces. There is a particular Bheej mantra for every type of Rudraksha. Choose the right one from the list depending on the Rudraksha type you have with you. Chant the mantra 27 times for each of the Mukha in your Rudraksha. Wave incense sticks in front of the Rudraksha, pray for the blessings of Lord Shiva and wear the Rudraksha. Do arati to Lord Shiva and prostrate in front of Lord Shiva. Rudraksha is good medicine for skin diseases. In leprosy of both the kinds, it can be used. It affects as a medicine to cure sores, ringworm, pimples, boils and it is useful in burns also. It is useful for women during pregnancy. Rudraksha is very good for people suffering from blood pressure. It keeps the B.P. normal. For this Rudraksha rosary should be worn in such a manner that it should touch the heart. One who wears Rudraksha can never fall prey to a sudden heart attack, shrinking of heart or brain hemorrhage. The patient of blood pressure should keep the five faced Rudraksha in water filled in a glass vessel throughout the night and should drink it as soon as he gets up in the morning. By doing so the person would have normal Blood pressure. Rudraksha is very good for constipation and other heart ailments. Put a rudraksha in a copper pot filled with water at night to drink in the morning to benefit from heart troubles and constipation. It cures ulcers if applied in a paste made after scrubbing in water. The children, who are mostly sick with fever, should wear three faced Rudraksha. In Chechak (typhus) Rudraksha and black pepper having equal weight should be ground and sieved through a cloth sieve. This powder should be drunk with stale water to cure Chechak. A cough is cured fully if the powder of ten-faced Rudraksha is rubbed and licked with milk thrice a day. Hysteria, Leucorrhoea and female diseases related to genital organs can be cured by wearing 3 (three) beads of six faced Rudraksha. All the diseases relating to the mind and brain are cured by drinking milk that is boiled with four faced Rudraksha. Ancient Hindu Scriptures says that Lord Vishnu is the best of all Purushas, Ganga of all rivers, Kashyapa of munis, Uchchhaihsravas of horses, Maha Deva of devas, Bhagavad of Devis, so the rosary of rudraksha is the best of all rosaries. All the fruits that occur by reading the Stotras (liturgical hymns) and holding all the Vratas (fasts) are obtained by wearing rudraksha. The Rudraksha beads can help a person attain a perfect balance between the three ‘Tridoshas’ in his body, namely bile, wind, and phlegm. I have always known of Rudraksha as a spiritual bead but never knew there were so many varients in rudraksha itself. I am amazed by the information you have shared regarding the different types of Rudraksha and their true significance. Very well written indeed. Looking forward to more such informative blogs. Thanks a lot, Samidha. Such a nice response from you is good enough to energize and inspire me to work harder and perform better. I’m a student, And I wanna wear both 4 Mukhi and 5 Mukhi Rudraksha together. Can i wear both of them at the same time? Hello dear Vivek Kumar. Different combinations of Rudrakshas are in general beneficial in different ways. But I would recommend you to consult your astrologer before you arrive at a final decision to wear these two Rudraksha in combination.